The Louvre Museum, located in central Paris is one of the most famous museums in the world. The massive museum, once a royal palace, houses an immense art collection, featuring everything from early Greek and Roman statuary to the 19th century. (The Orsay Museum is dedicated to 19th century art and various museums around Paris, including the Pompidou Centre features modern art.) Perhaps the most important piece in the museum is the Mona Lisa (La Gioconda, in French) by Leonardo da Vinci. The Louvre also contains the Venus de Milo, the Winged Victory of Samothrace, and the Marly Horses by Coustou The museum was also featured prominently in the runaway bestseller, The Da Vinci Code. Viewing the Louvre's varied architecture is like taking a French history course. The first royal castle on the site was finished in 1190 by King Philippe II, and was used primarily as a fortress to defend against Viking attacks. That early castle was subsequently replaced in the 16th century with the oldest part of the museum, but the early 12th century foundation can still be seen inside Louvre Museum. Throughout the centuries, French kings added to the palace, most notably Henri IV who added the Grande Galerie, a section of the museum that runs more than a quarter of a mile along the Seine and the Richelieu Wing, added by Louis XIII and named for his infamous finance minister. The distinctive Arc de Triomphe du Carrousel, which stands in Louvre's courtyard, was added by Napoleon I in 1805 to commemorate his victories. 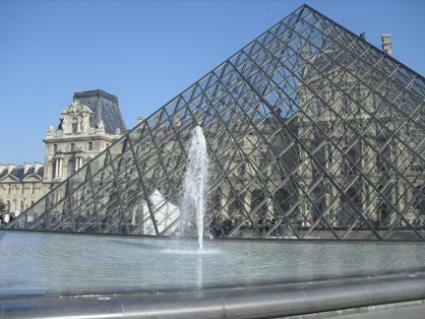 The most controversial and, arguably, one of the most interesting, additions to the Louvre was the Pyramid Entrance designed by Chinese-American architect, I. M. Pei (who also designed the Rock and Roll Hall of Fame building in Cleveland). This glass inverted pyramid, located in the center of the museum's courtyard, opened in 1989 and provides the somewhat dark and formal Louvre with streaming light throughout the day. The Louvre Museum's art collection is one of the most extensive and the most important in the world. The Louvre's holdings began with the paintings, sculptures, and drawings amassed by the renaissance King Francois I, patron to Leonardo da Vinci, among other masters. Donations and acquisitions augmented the collection over the centuries. Once a private museum, reserved for royalty and their guests, the Louvre opened to the public shortly after the French revolution and has been a national treasure ever since. The Louvre Museum's collections span the ages from early Phoenician and Egyptian sculpture and art to the end of the 18th century. The displays include objets d'art, furniture, textiles, books, artifacts, and engravings as well as sculpture and paintings. The Louvre, located between the Seine and the Rue de Rivoli, is one of the most visited attractions in Paris. It is impossible and foolhardy to try to see the entire museum in one visit. Instead, concentrate on one period or one genre, such as European sculpture, during one time period. The Louvre's vast collection can seem overwhelming, but it is also exhilarating. Where else can you see so many works by important masters in one place? The city of Paris makes it easy for visitors to sample the different museums there. The Paris Museum Pass is a one or three day pass that gives visitors access to over seventy Paris museums and monuments, including the Louvre. Not only do you save money, but pass holders avoid the, sometimes long, lines to buy tickets for the museum. Children under 18 enter free with an adult pass holder. With the Paris Museum Pass, you don't have to feel bad about just visiting one room or wing. Plus, you can return the next day to see another section.